Alexander Hamilton, the American statesman and economist, was born, as a British subject, on the island of Nevis in the West Indies on the 11th of January 1757. He came of good family on both sides. His father, James Hamilton, a Scottish merchant of St. Christopher, was a younger son of Alexander Hamilton of Grange, Lanarkshire, by Elizabeth, daughter of Sir R. Pollock. His mother, Rachael Fawcett (Faucette), of French Huguenot descent, married when very young a Danish proprietor of St. Croix, John Michael Levine, with whom she lived unhappily and whom she soon left, subsequently living with James Hamilton; her husband procured a divorce in 1759, but the court forbade her remarriage. Such unions as hers with James Hamilton were long not uncommon in the West Indies. By her James Hamilton had two sons, Alexander and James. Business misfortunes having caused his father's bankruptcy, and his mother dying in 1768, young Hamilton was thrown upon the care of maternal relatives at St. Croix, where, in his twelfth year, he entered the counting-house of Nicholas Cruger. Shortly afterward Mr. Cruger, going abroad, left the boy in charge of the business. The extraordinary specimens we possess of his mercantile correspondence and friendly letters, written at this time, attest an astonishing poise and maturity of mind, and self-conscious ambition. His opportunities for regular schooling must have been very scant; but he had cultivated friends who discerned his talents and encouraged their development, and he early formed the habits of wide reading and industrious study that were to persist through his life. An accomplishment later of great service to Hamilton, common enough in the Antilles, but very rare in the English continental colonies, was a familiar command of French. In 1772 some friends, impressed by a description by him of the terrible West Indian hurricane in that year, made it possible for him to go to New York to complete his education. Arriving in the autumn of 1772, he prepared for college at Elizabethtown, N.J., and in 1774 entered King's College (now Columbia University) in New York City. His studies, however, were interrupted by the War of American Independence. A visit to Boston seems to have thoroughly confirmed the conclusion, to which reason had already led him, that he should cast in his fortunes with the colonists. Into their cause he threw himself with ardour. In 1774-1775 he wrote two influential anonymous pamphlets, which were attributed to John Jay; they show remarkable maturity and controversial ability, and rank high among the political arguments of the time. He organized an artillery company, was awarded its captaincy on examination, won the interest of Nathanael Greene and George Washington by the proficiency and bravery he displayed in the campaign of 1776 around New York City, joined Washington's staff in March 1777 with the rank of lieutenant-colonel, and during four years served as his private secretary and confidential aide. The important duties with which he was entrusted attest Washington's entire confidence in his abilities and character; then and afterwards, indeed, reciprocal confidence and respect took the place, in their relations, of personal attachment. But Hamilton was ambitious for military glory -- it was an ambition he never lost; he became impatient of detention in what he regarded as a position of unpleasant dependence, and (Feb. 1781) he seized a slight reprimand administered by Washington as an excuse for abandoning his staff position. Later he secured a field command, through Washington, and won laurels at Yorktown, where he led the American column in the final assault on the British works. In 1780 he married Elizabeth, daughter of General Philip Schuyler, and thus became allied with one of the most distinguished families in New York. Meanwhile, he had begun the political efforts upon which his fame principally rests. In letters of 1779-1780 he correctly diagnoses the ills of the Confederation, and suggests with admirable prescience the necessity of centralization in its governmental powers; he was, indeed, one of the first, if not to conceive, at least to suggest adequate checks on the anarchic tendencies of the time. After a year's service in Congress in 1782-1783, in which he experienced the futility of endeavouring to attain through that decrepit body the ends he sought, he settled down to legal practice in New York. The call for the Annapolis Convention (1786) was Hamilton's opportunity. A delegate from New York, he supported James Madison in inducing the Convention to exceed its delegated powers and summon the Federal Convention of 1787 at Philadelphia (himself drafting the call); he secured a place on the New York delegation; and, when his anti-Federal colleagues withdrew from the Convention, he signed the Constitution for his state. So long as his colleagues were present his own vote was useless, and he absented himself for some time from the debates after making one remarkable speech (June 18th, 1787). In this he held up the British government as the best model in the world. Though fully conscious that monarchy in America was impossible, he wished to obtain the next best solution in an aristocratic, strongly centralized, coercive, but representative union, with devices to give weight to the influence of class and property. His plan had no chance of success; but though unable to obtain what he wished, he used his great talents to secure the adoption of the Constitution. To this struggle was due the greatest of his writings, and the greatest individual contribution to the adoption of the new government, The Federalist, which remains a classic commentary on American constitutional law and the principles of government, and of which Fran�ois Guizot said that "in the application of elementary principles of government to practical administration" it was the greatest work known to him. Its inception, and much more than half its contents were Hamilton's (the rest Madison's and John Jay's). Sheer will and reasoning could hardly be more brilliantly and effectively exhibited than they were by Hamilton in the New York convention of 1788, whose vote he won, against the greatest odds, for the ratification of the Constitution. It was the judgment of Chancellor James Kent, the justice of which can hardly be disputed, that "all the documentary proof and the current observation of the time lead us to the conclusion that he surpassed all his contemporaries in his exertions to create, recommend, adopt and defend the Constitution of the United States." When the new government was inaugurated, Hamilton became secretary of the treasury in Washington's cabinet. Congress immediately referred to him a press of queries and problems, and there came from his pen a succession of papers that have left the strongest imprint on the administrative organization of the national government -- two reports on public credit, upholding an ideal of national honor higher than the prevalent popular principles; a report on manufactures, advocating their encouragement (e.g. by bounties paid from surplus revenues amassed by tariff duties) -- a famous report that has served ever since as a storehouse of arguments for a national protective policy; a report favoring the establishment of a national bank, the argument being based on the doctrine of "implied powers" in the Constitution, and on the application that Congress may do anything that can be made, through the medium of money, to subserve the "general welfare" of the United States -- doctrines that, through judicial interpretation, have revolutionized the Constitution; and, finally, a vast mass of detailed work by which order and efficiency were given to the national finances. In 1793 he put to confusion his opponents who had brought about a congressional investigation of his official accounts. The success of his financial measures was immediate and remarkable. They did not, as is often but loosely said, create economic prosperity; but they did prop it, in an all-important field, with order, hope and confidence. His ultimate purpose was always the strengthening of the union; but before particularizing his political theories, and the political import of his financial measures, the remaining events of his life may be traced. His activity in the cabinet was by no means confined to the finances. He regarded himself, apparently, as premier, and sometimes overstepped the limits of his office in interfering with other departments. The heterogeneous character of the duties placed upon his department by Congress seemed in fact to reflect the English idea of its primacy. Hamilton's influence was in fact predominant with Washington (so far as any man could have predominant influence.) Thus it happens that in foreign affairs, whatever credit properly belongs to the Federalists as a party for the adoption of that principle of neutrality which became the traditional policy of the United States must be regarded as largely due to Hamilton. But allowance must be made for the mere advantage of initiative which belonged to any party that organized the government -- the differences between Hamilton and Thomas Jefferson, in this question of neutrality, being almost purely factitious. On domestic policy their differences were vital, and in their conflicts over Hamilton's financial measures they organized, on the basis of varying tenets and ideals which have never ceased to conflict in American politics, the two great parties of Federalists and Democrats (or Democratic-Republicans.) On the 31st of January 1795 Hamilton resigned his position as secretary of the treasury and returned to the practice of law in New York, leaving it for public service only in 1798-1800, when he was the active head, under Washington (who insisted that Hamilton should be second only to himself), of the army organized for war against France. But though in private life he remained the continual and chief adviser of Washington -- notably in the serious crisis of the Jay Treaty, of which Hamilton approved. Washington's Farewell Address (1796) was written for him by Hamilton. After Washington's death the Federalist leadership was divided (and disputed) between John Adams, who had the prestige of a varied and great career, and greater strength than any other Federalist with the people, and Hamilton, who controlled practically all the leaders of lesser rank, including much the greater part of the most distinguished men of the country, so that it has been very justly said that "the roll of his followers is enough of itself to establish his position in American history" (Lodge.) But Hamilton was not essentially a popular leader. When his passions were not involved, or when they were repressed by a crisis, he was far-sighted, and his judgment of men was excellent. But as Hamilton himself once said, his heart was ever the master of his judgment. He was, indeed, not above intrigue, but he was unsuccessful in it. He was a fighter through and through, and his courage was superb; but he was indiscreet in utterance, impolitic in management, opinionated, self-confident, and uncompromising in nature and methods. His faults are nowhere better shown than in his quarrel with John Adams. Three times, in order to accomplish ends deemed by him, personally, to be desirable, Hamilton used the political fortunes of John Adams, in presidential elections, as a mere hazard in his manoeuvres; moreover, after Adams became president, and so the official head of the party, Hamilton constantly advised the members of the president's cabinet, and through them endeavoured to control Adams's policy; and finally, on the eve of the crucial election of 1800, he wrote a bitter personal attack on the president (containing much confidential cabinet information), which was intended for private circulation, but which was secured and published by Aaron Burr, his legal and political rival. The mention of Burr leads us to the fatal end of another great political antipathy of Hamiltons life. He read Burr's character correctly from the beginning; deemed it a patriotic duty to thwart him in his ambitions; defeated his hopes successively of a foreign mission, the presidency, and the governorship of New York; and in his conversations and letters repeatedly and unsparingly denounced him. If these denunciations were known to Burr they were ignored by him until his last defeat. After that he forced a quarrel on a trivial bit of hearsay (that Hamilton had said he had a "despicable" opinion of Burr); and Hamilton, believing as he explained in a letter he left before going to his death -- that a compliance with the duelling prejudices of the time was inseparable from the ability to be in future useful in public affairs, accepted a challenge from him. The duel was fought at Weehawken on the Jersey shore of the Hudson opposite the City of New York. At the first fire Hamilton fell, mortally wounded, and he died on the following day, the 12th of July 1804. Hamilton himself did not intend to fire, but his pistol went off as he fell. The tragic close of his career appeased for the moment the fierce hatred of politics, and his death was very generally deplored as a national calamity. No emphasis, however strong, upon the mere consecutive personal successes of Hamilton's life is sufficient to show the measure of his importance in American history. That importance lies, to a large extent, in the political ideas for which he stood. His mind was eminently "legal." He was the unrivalled controversialist of the time. His writings, which are distinguished by clarity, vigour and rigid reasoning, rather than by any show of scholarship -- in the extent of which, however solid in character Hamilton's might have been, he was surpassed by several of his contemporaries -- are in general strikingly empirical in basis. He drew his theories from his experiences of the Revolutionary period, and he modified them hardly at all through life. In his earliest pamphlets (1774-1775) he started out with the ordinary pre-Revolutionary Whig doctrines of natural rights and liberty; but the first experience of semi-anarchic states'-rights and individualism ended his fervor for ideas so essentially alien to his practical, logical mind, and they have no place in his later writings. The feeble inadequacy of conception, infirmity of power, factional jealousy, disintegrating particularism, and vicious finance of the Confederation were realized by many others; but none other saw so clearly the concrete nationalistic remedies for these concrete ills, or pursued remedial ends so constantly, so ably, and so consistently. An immigrant, Hamilton had no particularistic ties; he was by instinct a "continentalist" or federalist. He wanted a strong union and energetic government that should "rest as much as possible on the shoulders of the people and as little as possible on those of the state legislatures"; that should have the support of wealth and class; and that should curb the states to such an "entire subordination" as nowise to be hindered by those bodies. At these ends he aimed with extraordinary skill in all his financial measures. As early as 1776 he urged the direct collection of federal taxes by federal agents. From 1779 onward we trace the idea of supporting government by the interest of the propertied classes; from 1781 onward the idea that a not-excessive public debt would be a blessing in giving cohesiveness to the union: hence his device by which the federal government, assuming the war debts of the states, secured greater resources, based itself on a high ideal of nationalism, strengthened its hold on the individual citizen, and gained the support of property. In his report on manufactures his chief avowed motive was to strengthen the union. To the same end he conceived the constitutional doctrines of liberal construction, "implied powers", and the general welfare, which were later embodied in the decisions of John Marshall. The idea of nationalism pervaded and quickened all his life and works. With one great exception, the dictum of Guizot is hardly an exaggeration, that "there is not in the Constitution of the United States an element of order, of force, of duration, which he did not powerfully contribute to introduce into it and to cause to predominate." The exception, as American history showed, was American democracy. The loose and barren rule of the Confederation seemed to conservative minds such as Hamilton's to presage, in its strengthening of individualism, a fatal looseness of social restraints, and led him on to a dread of democracy that he never overcame. Liberty, he reminded his fellows, in the New York Convention of 1788, seemed to be alone considered in government, but there was another thing equally important: "a principle of strength and stability in the organization... and of vigor in its operation." But Hamilton's governmental system was in fact repressive. He wanted a system strong enough, he would have said, to overcome the anarchic tendencies loosed by war, and represented by those notions of natural rights which he had himself once championed; strong enough to overbear all local, state and sectional prejudices, powers or influence, and to control -- not, as Jefferson would have it, to be controlled by -- the people. Confidence in the integrity, the self-control, and the good judgment of the people, which was the content of Jefferson's political faith, had almost no place in Hamilton's theories. "Men", said he, "are reasoning rather than reasonable animals." The charge that he labored to introduce monarchy by intrigue is an underestimate of his good sense. Hamilton's thinking, however, did carry him foul of current democratic philosophy; as he said, he presented his plan in 1787 "not as attainable, but as a model to which we ought to approach as far as possible"; moreover, he held through life his belief in its principles, and in its superiority over the government actually created; and though its inconsistency with American tendencies was yearly more apparent, he never ceased to avow on all occasions his aristocratic-monarchical partialities. Moreover, his preferences for at least an aristocratic republic were shared by many other men of talent. When it is added that Jefferson's assertions, alike as regards Hamilton's talk and the intent and tendency of his political measures, were, to the extent of the underlying basic fact -- but discounting Jefferson's somewhat intemperate interpretations -- unquestionably true, it cannot be accounted strange that Hamilton's Democratic opponents mistook his theoretic predilections for positive designs. Nor would it be a strained inference from much that he said, to believe that he hoped and expected that in the "crisis" he foresaw, when democracy should have caused the ruin of the country, a new government might be formed that should approximate to his own ideals. From the beginning of the excesses of the French Revolution he was possessed by the persuasion that American democracy, likewise, might at any moment crush the restraints of the Constitution to enter on a career of license and anarchy. To this obsession he sacrificed his life. After the Democratic victory of 1800, his letters, full of retrospective judgments and interesting outlooks, are but rarely relieved in their sombre pessimism by flashes of hope and courage. His last letter on politics, written two days before his death, illustrates the two sides of his thinking already emphasized: in this letter he warns his New England friends against dismemberment of the union as "a clear sacrifice of great positive advantages, without any counterbalancing good; administering no relief to our real disease, which is democracy, the poison of which, by a subdivision, will only be more concentrated in each part, and consequently the more virulent." To the end he never lost his fear of the states, nor gained faith in the future of the country. He labored still, in mingled hope and apprehension, "to prop the frail and worthless fabric", but for its spiritual content of democracy he had no understanding, and even in its nationalism he had little hope. Yet probably to no one man, except perhaps to Washington, does American nationalism owe so much as to Hamilton. In the development of the United States the influence of Hamiltonian nationalism and Jeffersonian democracy has been a reactive union; but changed conditions since Hamilton's time, and particularly since the U.S. Civil War, are likely to create misconceptions as to Hamilton's position in his own day. Great constructive statesman as he was, he was also, from the American point of view, essentially a reactionary. He was the leader of reactionary forces -- constructive forces, as it happened -- in the critical period after the War of American Independence, and in the period of Federalist supremacy. He was in sympathy with the dominant forces of public life only while they took, during the war, the predominant impress of an imperfect nationalism. Jeffersonian democracy came into power in 1800 in direct line with colonial development; Hamiltonian Federalism was a break in that development; and this alone can explain how Jefferson could organize the Democratic Party in face of the brilliant success of the Federalists in constructing the government. 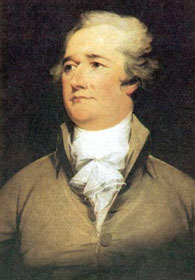 Hamilton stigmatized his great opponent as a political fanatic; but actualist as he claimed to be, Hamilton could not see, or would not concede, the predominating forces in American life, and would uncompromisingly have minimized the two great political conquests of the colonial period -- local self-government and democracy. Few Americans have received higher tributes from foreign authorities. Talleyrand, personally impressed when in America with Hamilton's brilliant qualities, declared that he had the power of divining without reasoning, and compared him to Fox and Napoleon because he had "devine l'Europe." Of the judgments rendered by his countrymen, Washington's confidence in his ability and integrity is perhaps the most significant. Chancellor James Kent, and others only less competent, paid remarkable testimony to his legal abilities. Chief Justice Marshall ranked him second to Washington alone. No judgment is more justly measured than Madison's (in 1831): "That he possessed intellectual powers of the first order, and the moral qualities of integrity and honor in a captivating degree, has been awarded him by a suffrage now universal. If his theory of government deviated from the republican standard he had the candor to avow it, and the greater merit of cooperating faithfully in maturing and supporting a system which was not his choice." In person Hamilton was rather short and slender; in carriage, erect, dignified and graceful. Deep-set, changeable, dark eyes vivified his mobile features, and set off his light hair and fair, ruddy complexion. His head in the famous John Trumbull portrait is boldly poised and very striking. The captivating charm of his manners and conversation is attested by all who knew him, and in familiar life he was artlessly simple. Friends he won readily, and he held them in devoted attachment by the solid worth of a frank, ardent, generous, warm-hearted and highminded character. Versatile as were his intellectual powers, his nature seems comparatively simple. A firm will, tireless energy, aggressive courage and bold self-confidence were its leading qualities; the word "intensity" perhaps best sums up his character. His Scotch and Gallic strains of ancestry are evident; his countenance was decidedly Scotch; his nervous speech and bearing and vehement temperament rather French; in his mind, agility, clarity and penetration were matched with logical solidity. The remarkable quality of his mind lay in the rare combination of acute analysis and grasp of detail with great comprehensiveness of thought. So far as his writings show, he was almost wholly lacking in humor, and in imagination little less so. He certainly had wit, but it is hard to believe he could have had any touch of fancy. In public speaking he often combined a rhetorical effectiveness and emotional intensity that might take the place of imagination, and enabled him, on the coldest theme, to move deeply the feelings of his auditors. Authorities differ on whether a 1755 or 1757 date is correct.